August 11, 2014 By Elise 13 Comments This post may contain affiliate links. Please read my disclosure policy for more info. 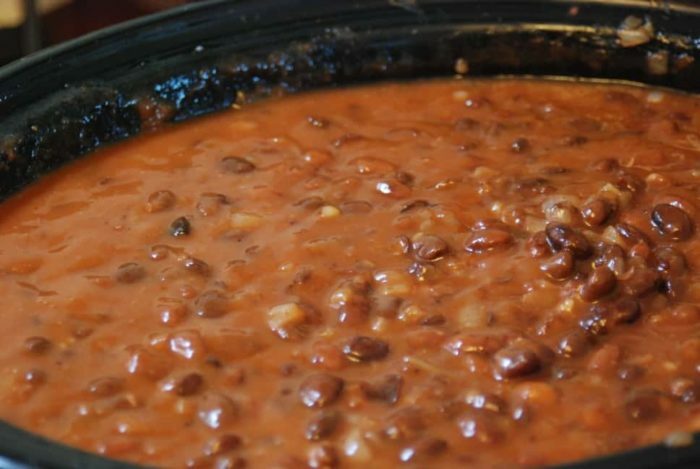 A big part of living frugally is making your own convenience food, and this recipe for how to can baked beans fits this bill perfectly, especially for those of us who need to use gluten-free recipes, and on those too-busy-to-think-about-dinner days. They give you the ability to have dinner on the table in five minutes flat. I mean, seriously – how can you beat that? 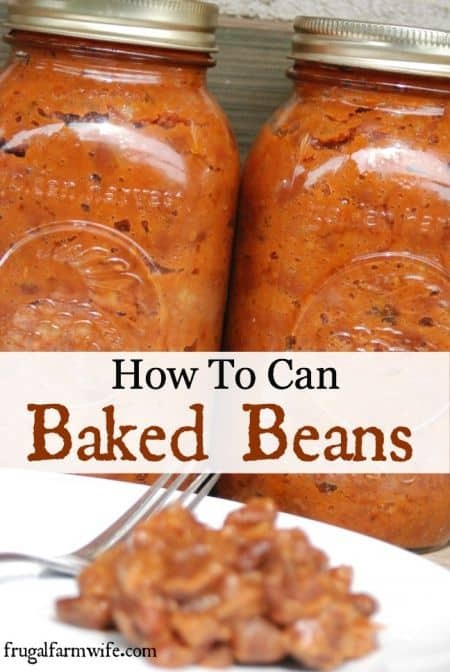 This is my method for canning baked beans start to finish. Feel free to substitute your favorite recipe, and just follow the canning directions. Rinse beans, cover with water, and soak for 12 hours. Drain the cooked beans, reserving the broth. Fry bacon, and crumble on top of the beans. Sautée onion in bacon grease. While onion is sautéeing, pile barbecue sauce, sorghum, ketchup, mustard, and brown sugar into the bean pot until it tastes right. Of course, it won’t taste completely right until you get the onion in there, but you can get close. Once the onion is translucent, dump the skillet into the beans, grease and all. Once you’ve got the beans tasting right, start adding some of the bean broth back in until it’s nice and soupy. Don’t worry about goign over board on this, moisture seeps out during the canning process, so you’ll want a lot of it to start with. I hope you can kind of tell the soupiness from the picture. Line up clean jars, lids, and rings on your work area. Place a canning funnel into the first jar. Fill the jar with beans to about 3/4 of an inch from the top. Move the funnel to the next jar. Wipe rim of the first jar with a clean, damp cloth to make sure it’s clean of debri. Place lid and ring ontop, screwing the ring down firmly. Continue this process until all the beans are in jars. Next, it’s time to get your canner ready. For me, this entials inspecting the seal, setting the pressure weights in a safe place (i.e. where the kids can’t reach them), inserting the rack, and filling it with two quarts of water. Follow this link for more on how to use a pressure canner. Place your filled and capped jars in the canner, doing your best to make sure they’re not touching (but not stressing if they do), and heat over medium-high heat. Once a steady stream of steam begins to escape the pressure valve (which doesn’t yet have the pressure weights covering it), set the timer for ten minutes. After the ten minutes are up, put the weights on, and heat it up until it reaches ten pounds of pressure, or the weight starts jiggling depending on your canner. Set the timer for 45-60 minutes (I do 45), and continue monitoring the canner as it jiggles to make sure it doesn’t overheat or lose pressure. Turn off heat, and let the canner cool. Let the jars settle for at least 24 hours. Afte this time, you may test the seal by pressing to see if the “button” is sucked down flat, rinse any stickiness off the jars, and remove the rings for storage. Voila! you’re done! Now you’re probably thinking “what a long process”, and you’re right, it is! but it seems to me that after you’ve done some canning, it kind of becomes second nature, like washing dishes. I mean, seriously, to stand there and hand wash 45 dishes!? You’ve got to be kidding me, right? But if you’re like me, you do that twice or three times a day and think nothing of it. In my opinion, it’s well worth the extra time it takes, to have a ready-to-serve meal at my finger tips. Hey, thanks for sharing the recipe. I’ve never canned beans, but I’d like to try. I love to can and I love pork and beans, but you did not provide any measurements except for the red wine vinegar. Can you please expand? It’s hard to give measurements – I usually just add to taste, but you could start with a cup each of ketchup, barbecue sauce, and brown sugar and go from there. What size jars? I would need to use pint size or smaller. Does that affect the processing time? I would probably still do 45 minutes at ten pounds of pressure for pints. Beans are pretty dense, so it takes them a while to heat all the way to the inside. How many pints-quart jars does this make? I was wondering if you can do the water bath process for canning? I do not have a pressure canner. Also, I have not heard of sorghum before. I looked it up and I see both a syrup, as well as a grain. Is their something I can use in its place, or somewhere I can easily buy this ingredient? I think the rule for waterbath canning beans use to be 2 hours, and now it’s not recommended at all, so you’ll have to take your chances on that. Sorghum molasses is just that – a type of molasses. You can usually find molasses (NOT blackstrap!) in grocery store baking isles, or you can choose to omit it, and adjust the amounts of your other sauce ingredients. thank you for sharing! I plan to make this as soon as the weather cools a bit more and hopefully i can make enough to last through the winter and on into summer for BBQ’s! Hi there, I am new to pressure canning and have only done black beans. Even cooking from dry, they were overdone after canning – split open and super soft. I can’t wrap my head around cooking the beans first and then 45 min in a canner. Do they keep their shape and structure? They do keep their shape. The beans won’t absorb much moisture from the baked bean syrup. The canning time is primarily to kill any microbes that might be in the jars.